A commercially produced Cherry Bakewell. A version of the Bakewell tart with huckleberries, marcona almonds, and crème fraîche sherbet served at The French Laundry, California. A Bakewell tart is an English confection consisting of a shortcrust pastry shell beneath layers of jam, frangipane, and a topping of flaked almonds. It is a version of a Bakewell pudding and although closely associated with the town of Bakewell in Derbyshire, there is no evidence it originated there. The Bakewell tart developed as a variant of the Bakewell pudding in the 20th century. Although the terms Bakewell tart and Bakewell pudding have been used interchangeably, each name refers to a specific dessert recipe. 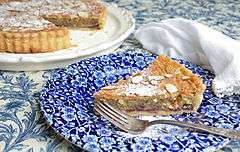 The tart is closely associated with the town of Bakewell in Derbyshire but there is no evidence it originated there. The tart is available in cake shops and supermarkets throughout the United Kingdom. A Cherry Bakewell, also known as a Bakewell cake, is a version of the tart where the frangipane is covered with a top layer of almond-flavoured fondant and a single half glacé cherry. In Gloucester, a similar tart was made using ground rice, raspberry jam and almond essence. In 2013, council leader Paul James discovered a recipe for "Gloucester tart" in a Gloucester history book. Gloucester museums revived the recipe, serving complimentary Gloucester tarts to museum patrons. 1 2 3 4 5 "The Bakewell Pudding - Bakewell, Derbyshire". BakewellOnline.co.uk. Retrieved 5 December 2015. 1 2 Davidson, Alan (2014). The Oxford Companion to Food. [S.l. ]: Oxford University Press. p. 54. ISBN 0199677336. Retrieved 22 December 2015. ↑ Enfield, Laura (2013-05-17). "Gloucester Tart revived - and it's better than the Bakewell!". Gloucester Citizen. Retrieved 2016-02-28. ↑ "Does tasty tart live up to city's name?" by Laura Enfield in Weekend Citizen, 18 May 2013, p. 17. ↑ kiejo (2013-05-09). "Gloucester's 'mystery tart'". Gloucester Citizen. Retrieved 2016-02-28.